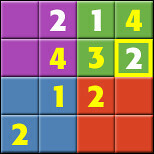 Doku Deluxe is a simplified version of Sudoku. If you're familiar with Sudoku then this will be a breeze! If you've never played Sudoku in your life, well, then learning to play Doku Deluxe will be more like a bracing wind. Not bad though! Let's start at the beginning. When you play Doku Deluxe you'll be in a room with up to four other players. Each person has their own Doku board! 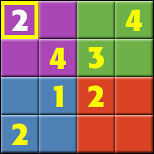 The board is a 4x4 grid divided into four colorful sections, or "quadrants." To get game pieces click "Spin" or hit the Enter key. Both methods work! 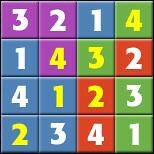 Whenever you start with a clean board, the first time you hit "Spin" you'll get 6-8 yellow numbers that fly to your board. You can't move yellow numbers! 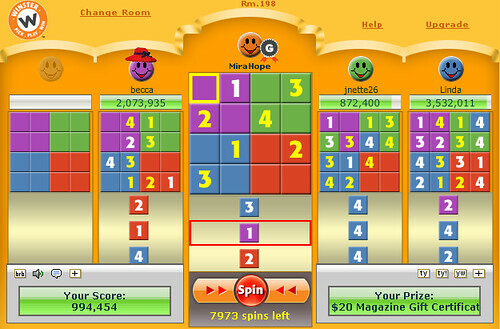 From then on out, each time you click "Spin" you'll get a single game piece. It will have a white number (1-4) and a solid colored background that's either purple, green, blue, or red. The background color relates to score, but it's really a bonus feature. More will be explained in the points section. 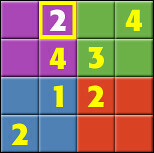 You can move pieces around your board by clicking and dragging them to new squares. Now, if you want to trade with a teammate, just click on the piece you want to trade away and drag it to the piece that you want. Your teammate will see a Yes/No balloon pop up with a picture of what you're offering. If your teammate accepts the trade, the pieces will switch places! On the other hand, if someone sends you a trade then you'll see a Yes/No balloon pop up with a picture of what they're offering. You don't have to accept any trades if you don't want to, but it's a great way to finish your puzzle quicker and maybe make a friend or two along the way! How do you finish the puzzle? Well, each quadrant has to have the numbers 1-4 in it. 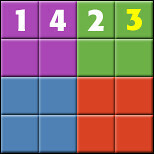 The background color of the pieces don't matter, but you can't have any repeating numbers! 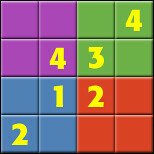 In addition to each quadrant needing to have the numbers 1-4, each row has to have the numbers 1-4 too. 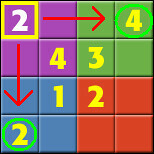 Again, the exact colors don't matter, but you can't have any repeating numbers! 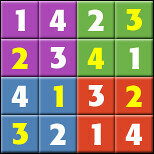 Lastly, each column has to have the numbers 1-4 too. A finished puzzle has no repeating numbers in each quadrant, row, and column! Take a look! Hey! Where are you going? Come back here! I promise you, this isn't impossible! Remember those yellow numbers you get at the very start? Since those numbers are always in the right spot you can figure the rest out with a little detective work. How about we start one together? It's the first spin and you got six yellow numbers! Think of them as anchors for the rest of the puzzle. On the next spin you get a purple 2. 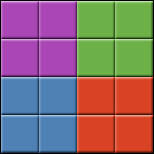 It's in the right color quadrant, but is it in the right spot? First look across the row to see if there's another 2. All clear on that count! Next look down the column to see if there's a 2. There is! That means the purple 2 isn't in the right spot. Just move it over one square. Now the purple 2 is in the purple quadrant, and there aren't any conflicts (duplicate numbers) in the row, column, or quadrant that it's in. It's in the right spot! Time to spin! A green 1. It doesn't conflict with any other numbers, so you could leave it there for now. But if you want the color bonus you should move it over to the green quadrant. On your 3rd spin you get a green 2! Now the green quadrant is complete. 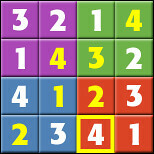 Once everything is in the right spot, Doku Deluxe will automatically submit the puzzle and you'll get Winster points! That's it! Just take it one piece at a time. Before you know it everything will click and you'll get how it works! You've probably noticed the pretty colors on the Doku boards. No? Well take a look again. This is what your board looks like before there are any numbers on it. 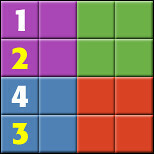 If you finish a Doku puzzle AND keep the colors intact, you'll get double the points! This is a bonus and isn't required, so don't worry if you can't do it. Oh! Don't forget that Club Winster members get four times the points! Start by focusing on the quadrants. First, work until you have one of each number in each quadrant. If you want to get the color bonus then spin any "wrong" color pieces or trade them to a teammate! Then you know something is mixed up. 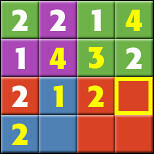 Switch pieces around until the line row looks right. If you want to keep the color bonus, only switch pieces that are the same color! This will keep each quadrant in it's separate color. Work your way through each row. If the puzzle doesn't flash and vanish (meaning you got it!) start working through the columns. You can do it! 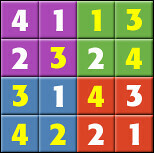 Remember, once the number part of Doku Deluxe is solved, the puzzle automatically submits to Winster and you get points! If you're working on the color bonus and just need one more piece, be careful! 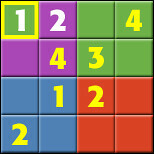 Any piece with the right number and any color background can finish the puzzle for you! To avoid losing out on the generous bonus, switch two numbers so that they're in the wrong spot. This way you won't accidentally complete the puzzle! Once you have the final piece, switch the mixed up pieces back into place. If you have a piece that you can't use, look around before you get rid of it! 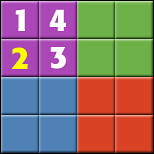 Most players arrange pieces in the "correct" spots as they go, so it's pretty easy to tell what they need. If you have an extra red 2, look to see who doesn?t have a red 2! Always say "Thank you!" and "You're welcome!" after trading pieces! At Winster we make this incredibly easy. Just click on the "ty" or "yw" buttons and you'll automatically say "Thank you" or "You're welcome!" You've learned all there is to know, so go give Doku Deluxe a try!